Here at last are the winners - I have had ongoing computer problems - but in the absence of dogs and children, Syko Tomte had the winners in his pocket. Miss Beau Jangles was first out and will be the proud new owner of the flowery Fugly Fabric. Libby has e-mailed me to say that she has been making dresses for girls around the World and so needed to replenish her fabric stash. Fortunately Libby didn't want Holly Hobby and so she has her passport ready to go to Diary of a Flutter.Kat. Kat has also emailed to say that her girls have a Holly Hobbie theme going on in their house at the moment - I used to have pink patchwork hexagon Holly Hobbie wall paper too - but a long time ago! Lucy is having a Stale Stash Swap starting Tuesday 20th March where one fat 1/4 can be swapped for another. 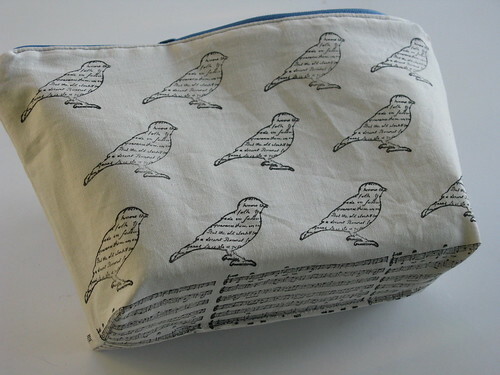 I'm thinking that I might print up some birds and typewriters to swap as lots of people liked this fabric. This is my Mouthy Pouch - inside out - so I will make one like this next!